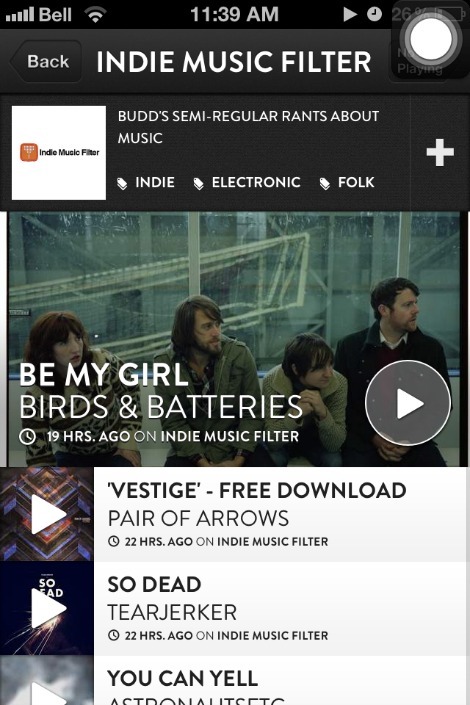 Here’s another great way to follow Indie Music Filter on the iPhone and iPad. Check out Shuffler.fm’s iPhone app and their iPad app. Shuffler.fm has always been a great audio magazine made my music blogs, where users can surf the music web through thousands of music sites and blogs, curated by tastemakers who filter the music information overload. The great thing about their site is that as you change from one track to the next (whether playing a genre station or one specific blog), it takes you to that blog post that contains the next track, exposing you to new blogs you might not have know before. Now, with the Shuffler.fm iPhone app and iPad apps, the radiozine goes mobile and they do it well. Check out a screenshot above of how the most recent songs and videos that I posted on Indie Music Filter is listed. Love it. Head to Shuffler for more info (and don’t forget to add me to your faves).